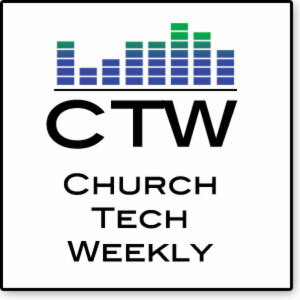 I am really excited to announce the latest addition to the Church Tech Arts empire: A weekly podcast entitled Church Tech Weekly (OK, maybe empire is overstating things a bit, perhaps network is a better descriptor). I’ve been wanting to do this for some time, but hadn’t hit on the right format to make it both useful and do-able. A month ago, I felt a plan coming together and through some prayer and plenty of thought, I think we have a good concept. The show will be recorded every Sunday night and will feature one guest from a wide-ranging roundtable of guys I know and love to talk tech with. We’re going to keep the show short--right around 30 minutes--for two reasons; first, I know you are busy and don’t have time to listen to another hour or hour and a half show each week. Second, I’m busy and I don’t have time to produce a long show each week. We’re going to keep it simple; audio only with minimal post-production. What we say is what you’ll hear. I’m negotiating for a theme song, but that will be about it. The show is available on iTunes right now, or subscribe directly to the RSS feed. You can download and listen to the first episode which features a fun and insightful conversation I had with Duke DeJong following our trips to InfoComm. We talk about the most interesting stuff we saw last week and provide some fun color commentary. It was a great conversation, and a fantastic way to kick off what I think is going to be an enjoyable podcast. Coming up this weekend, I’ll be talking with Bob Nahrstadt of Moyer Sound about a few new digital signage solutions. New shows should be up on iTunes every week by Monday morning if all goes well. Please give it a listen and tell me what you think. Also, if you would like to e-mail questions you’d like us to discuss, feel free to send them to ctw [at] churchtecharts [dot] org. Thanks for reading--and listening!